EazyDraw a vector drawing application: For the full journey from Jaguar (macOS version 10.2 running Motorola 32 bit code) to Mojave (macOS 10.14 running secure hardened 64 bit App) on wide gamut color screens, EazyDraw has been the trail blazing App for vector drawing on macOS. Includes comprehensive support for bitmap and vector graphic formats: Import and ungroup for edit PDF, and EPS. Import and export SVG and now DXF. Preview and publish to EPS and TIFF with RGB or CMYK process colors. Exchange scaled CAD drawings using DXF. Publish web graphics. Create macOS, iOS, watchOS, tvOS and CarPlay App development graphics and icons. All new look with Mojave (macOS 10.14) light and dark mode support. Fully color managed supporting wide gamut Display P3 colors. Stay focused and productive under both light and dark ambient conditions. Change between light and dark modes on the fly, no need to quit and restart EazyDraw. Choose light or dark mode on System Settings, General Tab. 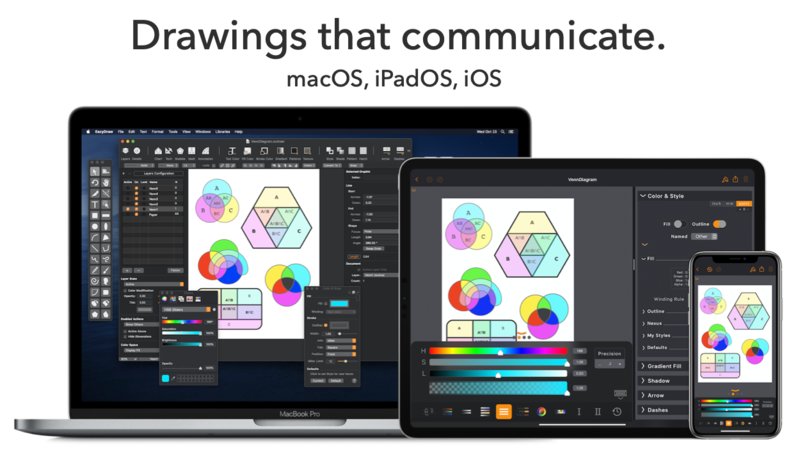 The EazyDraw user interface employs fully dynamic semantic driven system colors and icons, including accent color, light and dark mode, and accessibility contrast. Naturally, all the graphics for EazyDraw's dynamic Mojave-esque user interface were drawn and published to the Xcode asset catalogues (.xcassets) using EazyDraw. EazyDraw provides support for Apple's new Touch Bar technology. Our users are very excited about the potential of the new Touch Bar. The retina touch screen design is very responsive. We have noticed that this input device is especially well suited for slider controls. The large available width provides a new dimension in input control and accuracy. The Touch Bar is available on MacBook Pro, late 2016 models. EazyDraw's user interface is optimized for high resolution graphics on the newest Retina 5k technology. All user interface graphics are dual mastered high resolution icons and images. Designers can use EazyDraw to create 5k display content. App developers can use EazyDraw to easily design and produce User Interface Graphics. Layout your illustration with multiple pages. Assemble new designs with the convenience of multiple drawings open and accessible on the desktop. Drag and drop a single paragraph or entire layer from a reference drawing to design in progress. Get your designs on paper without the "CAD" hassle. 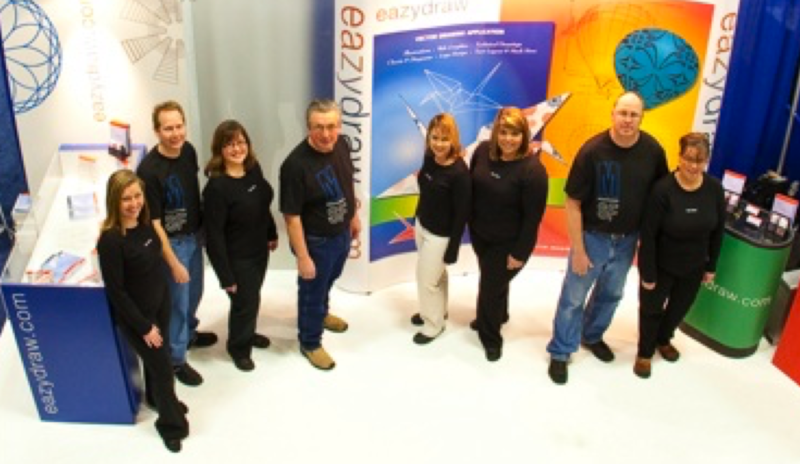 EazyDraw has all the capability needed to draw efficiently and accurately: draw to scale(s), use a grid, enter sizes numerically, wall and window tools, associative dimensions. DXF export and Import. Electronic publishing is supported with vector PDF and EPS import and export. Color space management (RGB and CMYK - with transparency) and conversion is provided with our professionally grade Export panel for these industry standard formats. Software developers across all of Apple's operating systems will find native support for creation of the required logos, app-icons, and screen images. Page Setup has electronic virtual printer settings for the defined image and icon specifications set by Apple. EazyDraw version 9 no longer supports import of MacDraw, MacDrawII, MacDrawPro, ClarisDraw or AppleWorks drawings. To import these drawings a retro-version of EazyDraw is provided. This version of EazyDraw still supports these retro-drawings and the import and conversion of PICT vector images.